The Classical great: Lydia Kavina has led the charge, tutoring students in mastering the instrument using techniques developed by herself, Rockmore, and Theremin. She even has an instructional video and regularly gives master classes and lessons. Kavina is a major globe-trotter, from Barcelona to Singapore just in the next few months, is a noted composer, and has performed with the likes of the London Symphony, BBC Orchestra, and Russian National Orchestra. Count `em: over 800 performances have made her the leading lady of the instrument. The One on Roller Skates: Of course, classical seriousness aside, an occasional gimmick never hurt any instrument. (Sadly, the skydiving pianist isn’t with us to enjoy this one.) Pamelia Kurstina is the “rollerskating” Thereminist. She even throws in haircuts with her Theremin lessons. The New York resident is a regular at Tonic, but has also played a space few of us can say we’ve gigged in: the Rose Planetarium. Oh, and please don’t ask her if she has a boyfriend; she apparently gets that a lot. The Performance Artist: Miss Hypnotique is both Thereminist and performance artist, as well as laptop musician. She’s produced radio documentaries, played caberet and avant-garde projects like Radio Science Orchestra, and lots of other stuff, too. See her interview with Synthtopia.com. 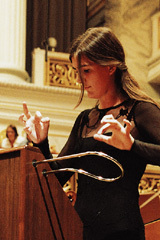 The Child Prodigy: Carolina Eyck started concertizing on Theremin at the age of eight; now just sixteen, she’s playing with groups like the HMH symphony orchestra Berlin. Of course, I could go on. There’s everyone from Intissar, the “naked Thereminist” (see the description of how Theremin talk quickly sounds like sexual innuendo), and more virtuosas like Barbara Buchholz. And, oh yeah, many male players, too. The range is clearly from oddball to Classical masters/mistresses. And the ranks are growing. So, can anyone do the same with laptop computers? It took the Theremin decades to get any recognition and it’s still fighting — maybe it’s just a matter of time. Musician’s Friend Buys Harmony Central: Whither Independence?